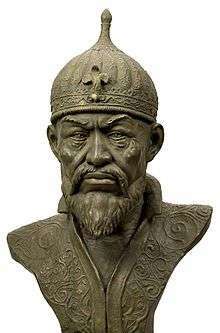 Timur (Persian: تیمور‎‎ Timūr, Chagatai: Temür, Uzbek: Temur; 9 April 1336— 18 February 1405), historically known as Tamerlane (Persian: تيمور لنگ‎‎ Timūr(-e) Lang, "Timur the Lame"), was a Turco-Mongol conqueror and the founder of the Timurid Empire in Persia and Central Asia. He was also the first ruler in the Timurid dynasty. Born into the Barlas confederation in Transoxiana on 9 April 1336, Timur gained control of the western Chagatai Khanate by 1370. From that base, he led military campaigns across Western, South and Central Asia, Caucasus and southern Russia, and emerged as the most powerful ruler in the Muslim world after defeating the Mamluks of Egypt and Syria, the emerging Ottoman Empire and the declining Delhi Sultanate. From these conquests he founded the Timurid Empire, but this empire fragmented shortly after his death. Timur is considered the last of the great nomadic conquerors of the Eurasian Steppe, and his empire set the stage for the rise of the more structured and lasting Gunpowder Empires in the 1500s and 1600s. :1 According to John Joseph Saunders, Timur's background was Iranized and not steppe nomad. Timur envisioned the restoration of the Mongol Empire of Genghis Khan. "In his formal correspondence Temur continued throughout his life to portray himself as the restorer of Chinggisid rights. He justified his Iranian, Mamluk and Ottoman campaigns as a re-imposition of legitimate Mongol control over lands taken by usurpers. To legitimize his conquests, Timur relied on Islamic symbols and language, referred to himself as the 'Sword of Islam' and patronized educational and religious institutions. He converted nearly all the Borjigin leaders to Islam during his lifetime. "Temur, a non-Chinggisid, tried to build a double legitimacy based on his role as both guardian and restorer of the Mongol Empire." Timur also decisively defeated the Christian Knights Hospitaller at Smyrna, styling himself a ghazi. 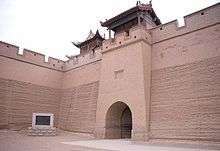 :91 By the end of his reign, Timur had gained complete control over all the remnants of the Chagatai Khanate, Ilkhanate, and Golden Horde and even attempted to restore the Yuan dynasty. Timur's armies were inclusively multi-ethnic and were feared throughout Asia, Africa, and Europe, sizable parts of which were laid waste by his campaigns. Scholars estimate that his military campaigns caused the deaths of 17 million people, amounting to about 5% of the world population. Timur was born in Transoxiana near the city of Kesh (modern Shahrisabz, Uzbekistan) some 80 kilometres (50 mi) south of Samarkand, part of what was then the Chagatai Khanate. His father, Taraqai, was a minor noble of the Barlas, who were Mongols that had been Turkified. According to Gérard Chaliand, Timur was a Muslim, and he saw himself as Genghis Khan's heir. Though not a Borjigid or a descendent of Genghis Khan, he clearly sought to invoke the legacy of Genghis Khan's conquests during his lifetime. His name Temur means "Iron" in old Turkic languages (Uzbek Temir, Turkish Demir). Both Timur and Demir are popular male names in Turkey today. Later Timurid dynastic histories claim that he was born on April 8, 1336, but most sources from his lifetime give ages that are consistent with a birthdate in the late 1320s. Historian Beatrice Forbes Manz suspects the 1336 date was designed to tie Timur to the legacy of Abu Sa'id Bahadur Khan, the last ruler of the Ilkhanate descended from Hulagu Khan, who died in that year. Timur was a Muslim, possibly belonging to the Naqshbandi school of Sufism, which was influential in Transoxiana. However, his chief official religious counsellor and adviser was the Hanafi scholar 'Abdu 'l-Jabbar Khwarazmi. 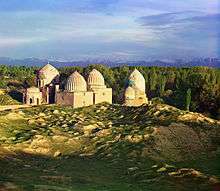 In Tirmidh, he had come under the influence of his spiritual mentor Sayyid Baraka, a leader from Balkh who is buried alongside Timur in Gur-e-Amir. Timur was known to hold Ali and the Ahl al-Bayt in high regard and has been noted by various scholars for his "pro-Alid" stance. Despite this, Timur was noted for attacking the Shia with Sunni apologism. Timur is regarded as a military genius, and as a brilliant tactician with an uncanny ability to work within a highly fluid political structure to win and maintain a loyal following of nomads during his rule in Central Asia. He was also considered extraordinarily intelligent – not only intuitively but also intellectually. :16 In Samarkand and his many travels, Timur, under the guidance of distinguished scholars, was able to learn the Persian, Mongolian, and Turkic languages. :9 More importantly, Timur was characterized as an opportunist. Taking advantage of his Turco-Mongolian heritage, Timur frequently used either the Islamic religion or the law and traditions of the Mongol Empire to achieve his military goals or domestic political aims. About 1360 Timur gained prominence as a military leader whose troops were mostly Turkic tribesmen of the region. He took part in campaigns in Transoxiana with the Khan of the Chagatai Khanate. Allying himself both in cause and by family connection with Kurgan, the dethroner and destroyer of Volga Bulgaria, he invaded Khorasan at the head of a thousand horsemen. This was the second military expedition that he led, and its success led to further operations, among them the subjugation of Khwarezm and Urgench. Following Kurgan's murder, disputes arose among the many claimants to sovereign power. Khan of Eastern Chagatai Khanate Tughlugh Timur of Kashgar, another descendant of Genghis Khan, invaded, interrupting this infighting. Timur was sent to negotiate with the invader but joined with him instead and was rewarded with Transoxania. At about this time his father died and Timur became chief of the Berlas as well. Tughlugh then attempted to set his son Ilyas Khoja over Transoxania, but Timur repelled this invasion with a smaller force. Likewise, Timur could not claim the supreme title of the Islamic world, caliph, because the "office was limited to the Quraysh, the tribe of the Prophet Muhammad". Therefore, Timur reacted to the challenge by creating a myth and image of himself as a "supernatural personal power" ordained by God. Since Timur had a successful career as a conqueror, it was easy to justify his rule as ordained and favored by God since no ordinary man could be a possessor of such good fortune that resistance would be seen as opposing the will of God. Moreover, the Islamic notion that military and political success was the result of Allah's favor had long been successfully exploited by earlier rulers. Therefore, Timur's assertions would not have seemed unbelievable to fellow Islamic people. After the death of Abu Sa'id, ruler of the Ilkhanate, in 1335, there was a power vacuum in Persia. 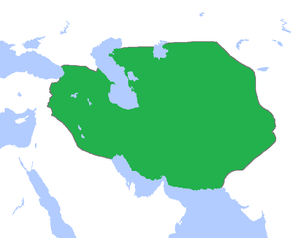 In the end Persia was split amongst the Muzaffarids, Kartids, Eretnids, Chobanids, Injuids, Jalayirids, and Sarbadars. In 1383, Timur started his lengthy military conquest of Persia, though he already ruled over much of Persian Khorasan by 1381, after Khwaja Mas'ud, of the Sarbadar dynasty surrendered. 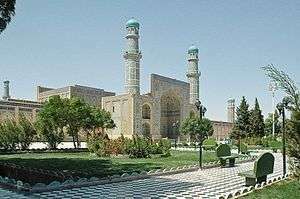 Timur began his Persian campaign with Herat, capital of the Kartid dynasty. When Herat did not surrender he reduced the city to rubble and massacred most of its citizens; it remained in ruins until Shahrukh Mirza ordered it's reconstruction. 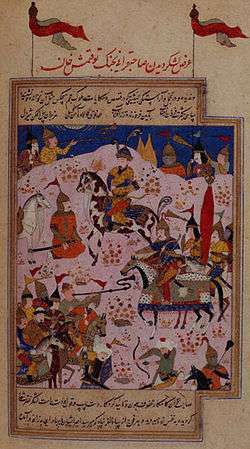 Timur sent a General to capture rebellious Kandahar. With the capture of Herat the Kartid kingdom surrendered and became vassals of Timur, but it would later be annexed in 1389 by Timur's son Miran Shah. Timur then headed west to capture the Zagros Mountains, passing through Mazandaran. During his travel through the north of Persia, he captured the then town of Tehran, which surrendered and was thus treated mercifully. He laid siege to Soltaniyeh in 1384. Khorasan revolted one year later, so Timur destroyed Isfizar, and the prisoners were cemented into the walls alive. The next year the kingdom of Sistan, under the Mihrabanid dynasty, was ravaged, and its capital at Zaranj was destroyed. Timur then returned to his capital of Samarkand, where he began planning for his Georgian campaign and Golden Horde invasion. In 1386 Timur passed through Mazandaran as he had when trying to capture the Zagros. He went near the city of Soltaniyeh, which he had previously captured but instead turned north and captured Tabriz with little resistance, along with Maragha. He ordered heavy taxation of the people, which was collected by Adil Aqa, who was also given control over Soltaniyeh. Adil was later executed because Timur suspected him of corruption. Timur then went north to begin his Georgian and Golden Horde campaigns, pausing his full-scale invasion of Persia. When he returned he found his generals had done well in protecting the cities and lands he had conquered in Persia. Though many rebelled, and his son Miran Shah, who may have been regent, was forced to annex rebellious vassal dynasties, his holdings remained. So he proceeded to capture the rest of Persia, specifically the two major southern cities of Isfahan and Shiraz. When he arrived with his army at Isfahan in 1387, the city immediately surrendered; he treated it with relative mercy as he normally did with cities that surrendered (unlike Herat). 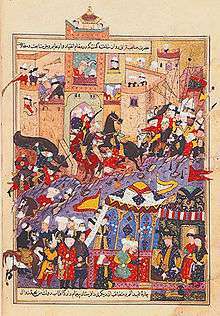 However, after Isfahan revolted against Timur's taxes by killing the tax collectors and some of Timur's soldiers, he ordered the massacre of the city's citizens; the death toll is reckoned at between 100,000 and 200,000. An eye-witness counted more than 28 towers constructed of about 1,500 heads each. This has been described as a "systematic use of terror against towns...an integral element of Tamerlane's strategic element", which he viewed as preventing bloodshed by discouraging resistance. His massacres were selective and he spared the artistic and educated. This would later influence the next great Persian conqueror: Nader Shah. Timur then began a five-year campaign to the west in 1392, attacking Persian Kurdistan. 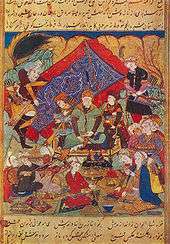 In 1393, Shiraz was captured after surrendering, and the Muzaffarids became vassals to Timur, though prince Shah Mansur rebelled but was defeated, and the Muzafarids were annexed. Shortly after Georgia was devastated so that the Golden Horde could not use it to threaten northern Iran. In the same year Timur caught Baghdad by surprise in August by marching there in only eight days from Shiraz. Sultan Ahmad Jalayir fled to Syria, where the Mamluk Sultan Barquq protected him and killed Timur’s envoys. 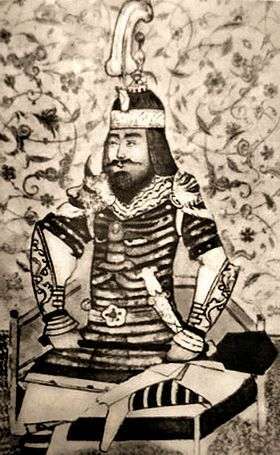 Timur left the Sarbadar prince Khwaja Mas'ud to govern Baghdad, but he was driven out when Ahmad Jalayir returned. Ahmad was unpopular but got some dangerous help from Qara Yusuf of the Kara Koyunlu; he fled again in 1399, this time to the Ottomans. In the first phase of the conflict with Tokhtamysh, Timur led an army of over 100,000 men north for more than 700 miles into the steppe. He then rode west about 1,000 miles advancing in a front more than 10 miles wide. 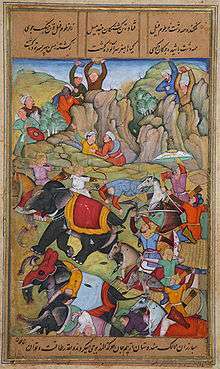 During this advance Timur's army got far enough north to be in a region of very long summer days causing complaints by his Muslim soldiers about keeping a long schedule of prayers. It was then that Tokhtamysh's army was boxed in against the east bank of the Volga River in the Orenburg region and destroyed at the Battle of the Kondurcha River, in 1391. In the second phase of the conflict Timur took a different route against the enemy by invading the realm of Tokhtamysh via the Caucasus region. In 1395 Timur defeated Tokhtamysh in the Battle of the Terek River, concluding the struggle between the two monarchs. Tokhtamysh was unable to restore his power or prestige, and he was killed about a decade later in the area of present-day Tyumen. During the course of Timur's campaigns his army destroyed Sarai, the capital of the Golden Horde, and Astrakhan, subsequently disrupting the Golden Horde's Silk Road. The Golden Horde no longer held power after their losses to Timur. 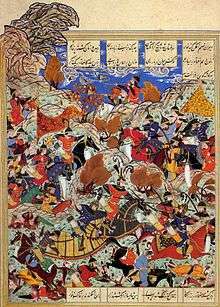 In May 1393 Timur's army invaded the Anjudan, crippling the Ismaili village only a year after his assault on the Ismailis in Mazandaran. The village was prepared for the attack, evidenced by its fortress and system of underground tunnels. 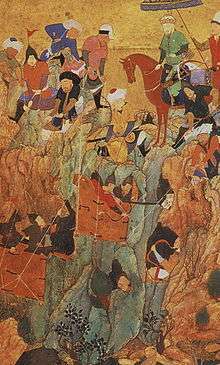 Undeterred, Timur's soldiers flooded the tunnels by cutting into a channel overhead. Timur's reasons for attacking this village are not yet well understood. However, it has been suggested that his religious persuasions and view of himself as an executor of divine will may have contributed to his motivations. The Persian historian Khwandamir explains that an Ismaili presence was growing more politically powerful in Persian Iraq. A group of locals in the region was dissatisfied with this and, Khwandamir writes, these locals assembled and brought up their complaint with Timur, possibly provoking his attack on the Ismailis there. In 1400 Timur invaded Christian Armenia and Georgia. 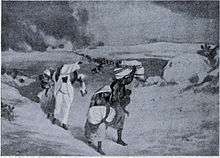 Of the surviving population, more than 60,000 of the local people were captured as slaves, and many districts were depopulated. Then Timur turned his attention to Syria, sacking Aleppo and Damascus. 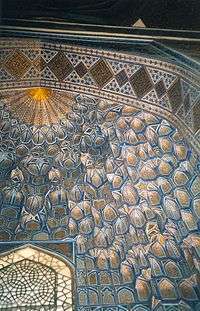 The city's inhabitants were massacred, except for the artisans, who were deported to Samarkand. Timur cited the killing of Hasan ibn Ali by Umayyad caliph Muawiyah I and the killing of Husayn ibn Ali by Yazid I as the reason for his massacre of the inhabitants of Damascus. After the Ankara victory, Timur's army ravaged Western Anatolia, with Muslim writers complaining that the Timurid army acted more like a horde of savages than that of a civilized conqueror. But Timur did take the city of Smyrna, a stronghold of the Christian Knights Hospitalers, thus he referred to himself as ghazi or "Warrior of Islam". A mass beheading was carried out in Smyrna by Timur's soldiers. He ruled over an empire that, in modern times, extends from southeastern Turkey, Syria, Iraq, and Iran, through Central Asia encompassing part of Kazakhstan, Afghanistan, Armenia, Azerbaijan, Georgia, Turkmenistan, Uzbekistan, Kyrgyzstan, Pakistan, and even approaches Kashgar in China. The conquests of Timur are claimed to have caused the deaths of up to 17 million people, an assertion impossible to verify. Of Timur's four sons, two (Jahangir and Umar Shaikh) predeceased him. His third son, Miran Shah, died soon after Timur, leaving the youngest son, Shah Rukh. Although his designated successor was his grandson Pir Muhammad b. Jahangir, Timur was ultimately succeeded in power by his son Shah Rukh. His most illustrious descendant Babur founded the Islamic Mughal Empire and ruled over most of Afghanistan and North India. Babur's descendants Humayun, Akbar, Jahangir, Shah Jahan and Aurangzeb, expanded the Mughal Empire to most of the Indian subcontinent. Markham, in his introduction to the narrative of Clavijo's embassy, states that after Timur died, his body "was embalmed with musk and rose water, wrapped in linen, laid in an ebony coffin and sent to Samarkand, where it was buried". 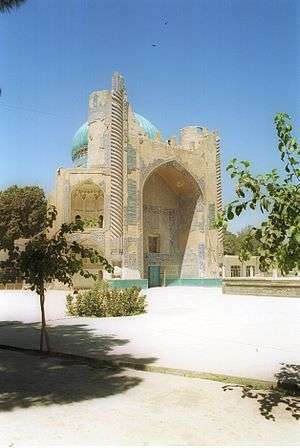 His tomb, the Gur-e Amir, still stands in Samarkand, though it has been heavily restored in recent years. By 1368, Han Chinese forces had driven the Mongols out of China. The first of the new Ming dynasty's emperors, the Hongwu Emperor, and his son, the Yongle Emperor, demanded and received homage from many Central Asian states as the political heirs to the former House of Kublai. The Ming emperors' treatment of Timur as a vassal did not sit well with the conqueror. In 1394 Hongwu's ambassadors eventually presented Timur with a letter addressing him as a subject. He summarily had the ambassadors Fu An, Guo Ji, and Liu Wei detained, and had the 1500 guards executed. Neither Hongwu's next ambassador, Chen Dewen (1397), nor the delegation announcing the accession of the Yongle Emperor fared any better. Timur eventually planned to conquer China. To this end Timur made an alliance with the Northern Yuan dynasty based in Mongolia and prepared all the way to Bukhara. 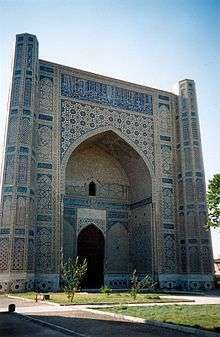 Engke Khan sent his grandson Öljei Temür Khan, also known as "Buyanshir Khan" after he converted to Islam while at the court of Timur in Samarkand. 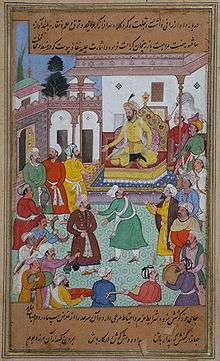 Just before his death, Timur designated his grandson Pir Muhammad ibn Jahangir as his successor. However, his other descendants did not abide by this wish, and spent the next fifteen years engaged in violent infighting. His son Shahrukh Mirza and grandson Khalil Sultan struggled for control until Shahrukh won. 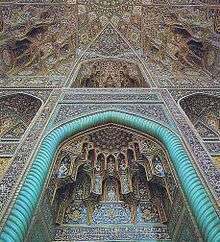 Inside the mausoleum – deep niches and diverse muqarnas decorate the inside the Gur-e Amir. Timur's legacy is a mixed one. While Central Asia blossomed under his reign, other places such as Baghdad, Damascus, Delhi and other Arab, Georgian, Persian, and Indian cities were sacked and destroyed and their populations massacred. He was responsible for the effective destruction of the Nestorian Christian Church of the East in much of Asia. Thus, while Timur still retains a positive image in Muslim Central Asia, he is vilified by many in Arabia, Iraq, Persia, and India, where some of his greatest atrocities were carried out. However, Ibn Khaldun praises Timur for having unified much of the Muslim world when other conquerors of the time could not. The next great conqueror of the middle east, Nader Shah, was greatly influenced by Timur and almost re-enacted Timur's conquests and battle strategies in his own campaigns. Like Timur, Nader Shah conquered most of Caucasia, Persia, and Central Asia along with also sacking Delhi. Timur's short-lived empire also melded the Turko-Persian tradition in Transoxiana, and in most of the territories which he incorporated into his fiefdom, Persian became the primary language of administration and literary culture (diwan), regardless of ethnicity. In addition, during his reign, some contributions to Turkic literature were penned, with Turkic cultural influence expanding and flourishing as a result. A literary form of Chagatai Turkic came into use alongside Persian as both a cultural and an official language. The earliest known history of his reign was Nizam ad-Din Shami's Zafarnama, which was written during Timur's lifetime. Between 1424 and 1428, Sharaf ad-Din Ali Yazdi wrote a second Zafarnama drawing heavily on Shami's earlier work. Ahmad ibn Arabshah wrote a much less favorable history in Arabic. Arabshah's history was translated by the Dutch Orientalist Jacobus Golius in 1636. The Malfuzat-i Timurī and the appended Tuzūk-i Tīmūrī, supposedly Timur's own autobiography, are almost certainly 17th century fabrications. 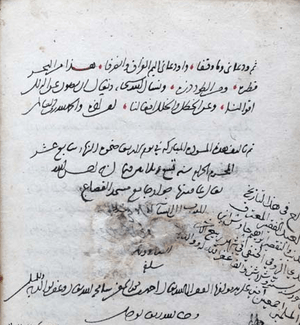 The scholar Abu Taleb Hosayni presented the texts to the Mughal emperor Shah Jahan, a distant descendant of Timur, in 1637–38, supposedly after discovering the Chagatai language originals in the library of a Yemeni ruler. Due to the distance between Yemen and Timur's base in Transoxiana and the lack of any other evidence of the originals, most historians consider the story highly implausible and suspect Hosayni of inventing both the text and its origin story. Timur's body was exhumed from his tomb on 19 June 1941 and his remains examined by the Soviet anthropologist Mikhail M. Gerasimov, Lev V. Oshanin and V. Ia. Zezenkova. It was determined that Timur was a tall and broad-chested man with strong cheek bones. At 5 feet 8 inches (1.73 meters), Timur was tall for his era. The examinations confirmed that Timur was lame and had a withered right arm due to his injuries. His right thighbone had knitted together with his kneecap, and the configuration of the knee joint suggests that he had kept his leg bent at all times and therefore would have had a pronounced limp. Gerasimov reconstructed the likeness of Timur from his skull and found that Timur's facial characteristics displayed Mongoloid features with some Caucasoid admixture. Oshanin also concluded that Timur's cranium showed predominately the characteristics of a South Siberian Mongoloid type. Toghay Turkhan Agha, concubine and mother of Shahrukh Mirza ibn Timur. Khalil Sultan ibn Timur - with Saray Mulk Khanum. Sultan Bakht Begum, married firstly Mohammed Mireke, married secondly, 1389/90, Soliman Shah- with Aljaz Turkhan Agha. ↑ Darwin, John (2008). After Tamerlane: the rise and fall of global empires, 1400-2000. Bloomsbury Press. pp. 29, 92. ISBN 9781596917606. ↑ J. J. Saunders (1 March 2001). The History of the Mongol Conquests. University of Pennsylvania Press. pp. 173–. ISBN 0-8122-1766-7. ↑ Forbes Manz, Beatrice (April 1998). "Temür and the Problem of a Conqueror's Legacy". Journal of the Royal Asiatic Society. Third. 8 (1): 25. JSTOR 25183464. ↑ Biran, Michal (October 2002). "The Chaghadaids and Islam: The Conversion of Tarmashirin Khan (1331-34)". Journal of the American Oriental Society. 122 (4): 742–752. doi:10.2307/3217613. ↑ "Timur". Encyclopædia Britannica, Online Academic Edition. 2007. 1 2 3 Beatrice F. Manz (2000). "Tīmūr Lang". Encyclopaedia of Islam. 10 (2nd ed.). Brill. Retrieved 24 April 2014. 1 2 3 Gérard Chaliand, Nomadic Empires: From Mongolia to the Danube translated by A.M. Berrett, Transaction Publishers, 2004. translated by A.M. Berrett. Transaction Publishers, p.75. ISBN 0-7658-0204-X. Limited preview at Google Books. 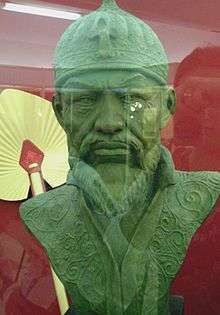 p. 75., ISBN 0-7658-0204-X, p.75., "Timur Leng (Tamerlane) Timur, known as the lame (1336–1405) was a Muslim Turk. He aspired to recreate the empire of his ancestors. He was a military genius who loved to play chess in his spare time to improve his military tactics and skill. And although he wielded absolute power, he never called himself more than an emir. ", "Timur Leng (Tamerlane) Timur, known as the lame (1336–1405) was a Muslim Turk from the Umus of Chagatai who saw himself as Genghis Khan's heir." 1 2 3 Manz, Beatrice Forbes (1988). "Tamerlane and the symbolism of sovereignty". Iranian Studies. 21 (1-2): 105–122. doi:10.1080/00210868808701711. JSTOR 4310596. 1 2 Chaliand, Gerard; Arnaud Blin (2007). The History of Terrorism: From Antiquity to Al Qaeda. University of California Press. p. 87. ISBN 978-0520247093. ↑ Singh, Raj Pal. Rise of the Jat power. Books.google.co.in. Retrieved 2012-05-22. ↑ Turnbull, Stephen (30 January 2007). The Great Wall of China 221 BC-1644 AD. Osprey Publishing. p. 23. ISBN 978-1-84603-004-8. Retrieved 2010-03-26. ↑ Adela C.Y. Lee. "Tamerlane (1336–1405) – ''The Last Great Nomad Power''". Silkroad Foundation. Retrieved 2012-05-22. ↑ Frances Carney Gies (September–October 1978). "The Man Who Met Tamerlane". Saudi Aramco World. 29 (5). ↑ Manz, Beatrice Forbes (1999). The Rise and Rule of Tamerlane. Cambridge University Press, p.109. ISBN 0-521-63384-2. Limited preview at Google Books. p.109. "In Temür's government, as in those of most nomad dynasties, it is impossible to find a clear distinction between civil and military affairs, or to identify the Persian bureaucracy as solely civil or the Turko-Mongolian solely with military government. In fact, it is difficult to define the sphere of either side of the administration and we find Persians and Chaghatays sharing many tasks. (In discussing the settled bureaucracy and the people who worked within it I use the word Persian in a cultural rather than ethnological sense. In almost all the territories which Temür incorporated into his realm Persian was the primary language of administration and literary culture. Thus the language of the settled 'diwan' was Persian and its scribes had to be thoroughly adept in Persian culture, whatever their ethnic origin.) Temür's Chaghatay emirs were often involved in civil and provincial administration and even in financial affairs, traditionally the province of Persian bureaucracy." ↑ Roy, Olivier (2007). The new Central Asia. I.B. Tauris. p. 7. ISBN 1-84511-552-X. 1 2 Hameed ud-Din (2011). "Abū Ṭāleb Ḥosaynī". Encyclopædia Iranica. Retrieved 17 September 2014. 1 2 3 Knobler, Adam (November 1995). "The Rise of Timur and Western Diplomatic Response, 1390–1405". Journal of the Royal Asiatic Society. Third Series. 5 (3). doi:10.1017/s135618630000660x. ↑ The History of Timur-Bec. 1. 1723. pp. xii–ix. Punctuation and spelling modernized. ↑ Mikhail Mikhaĭlovich Gerasimov (1971). The face finder. Hutchinson. p. 135. ISBN 978-0091055103. ↑ Enrique Serrano (2011-01-02). Tamerlan (Biblioteca Breve) (Spanish Edition). ISBN 9789584205407. Retrieved 2012-05-22.